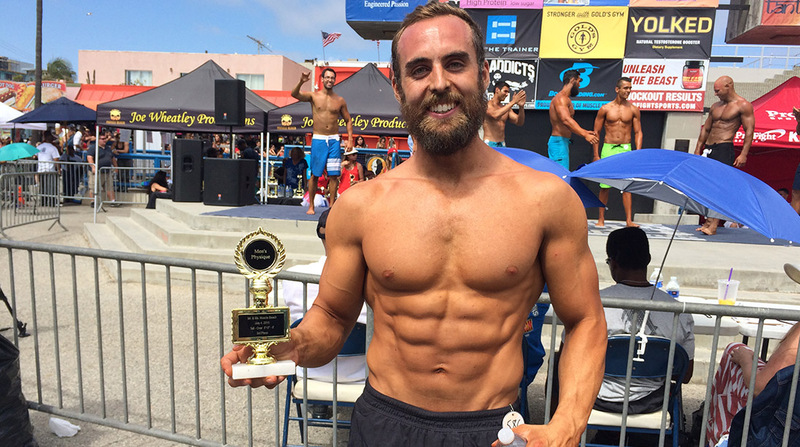 Pro Gamer and Fitness YouTube Star Jackson “Bajheera” Bliton offers up a few important things that gamers and gainers can learn from each other. Pro Gamer Bajheera (aka Jackson Bliton) is here to stomp on your stereotypes. He might be single-handedly destroying the myth of the scrawny, anti-social gamer and replacing it with something a bit more… well… badass. Feeling bad about your life yet? It’s not just the gamer myths that Bajheera’s demolishing… he’s also taking down your excuses. If a gamer can spend a full day at his computer and still manage to look like a bearded, wizardy version of Thor, then you can sure as hell find some time to get away from your desk in fit in a few lifting sessions. Below, Bajheera offers up a few pointed pieces of advice based on how he balances his active lifestyle with his sedentary job. See if you can learn a few things from this master of online mayhem. 1. Find a POSITIVE motivation. Make exercise a REWARD. I associate the fitness part of my life with my Dad and Dragon Ball Z. I remember being in the living room and my dad was doing pushups. He would do them as soon as he came home from work. He’d even do them with me on his back. Being active was part of a memory I enjoyed, so exercise is wired as a positive thing for me. Plus, I wanted to look and be like those guys on Dragon Ball Z who were saving the world. They trained hard, got their butts kicked, and came back stronger. If you slouch at your desk, you can undo all your hard work: it tightens your hamstrings, which can hurt your back, which just gets in the way of everything. Sit up, away from the back of your desk, keep your core engaged. Get up and move around every now and again. Don’t let your muscles live in a shortened position. I’m bouncing around all day while I play WoW [World of Warcraft] because I’m energized from my morning workout. Which leads to my next tip. Even if you start work 8 or 9 am, get that workout in early. It puts you in a better mood, and you have better energy for everything else you need to do. Plus, you’re stringing together effective actions. I hit the gym, now I want to keep my nutrition in line to maximize the effect of that workout. It’s a domino effect of motivation. And you need rest after a workout anyway so your muscles can recover and rebuild. So sitting at your desk is your rest and recovery period. 4. Focus on LONGTERM success. One viral video doesn’t make a successful YouTube channel. You have to have consistently good, engaging content to build your subscriber base. It’s the same with bodybuilding: you have to hit the gym every day, consistently working all those muscle groups to see incremental gains. In all of the things I do, I enjoy putting in work over a long period of time to accomplish a goal. Obviously, to have success in YouTube, you have to build a community around your content. In fitness, you go to the gym, you see people working hard, you see exercises you want to know more about, you should ask them about it. You learn from people you admire. And that creates accountability, too. You show up. There’s a lot of that in the gaming world as well - people being successful for doing something no one else has done, and you want to know more about it, you want to learn from their success. Make friends, share your interests, it’ll keep you motivated. That way you don’t have the instinct just to grab whatever’s around, whatever’s easy. Chances are the easy things won’t help you eat toward your goals. Every day when I get home from the gym, I prep my meals. I eat every two hours. If you go too long without eating, you get too hungry, and you make bad decisions. Gamers have to eat right too. Especially for those marathons, you need good nutrition (and physical activity) to keep your mind and reflexes sharp and alert. I’m a better gamer because I workout in the morning, and because I prepare my food like an athlete. I personally don’t need a lot of variety in my food. I want food that makes me feel good and accomplishes the goals I’m looking for. I’m training for Muscle Beach right now, which is a really great low-key friendly competition for people like me who are interested in being physique competitors but aren’t ready to compete at the highest levels yet. My main meals are chicken and broccoli. I have this basically 5 times throughout the day. Plus some whey protein. I’ll bring my calories down by 50-100 every 2 weeks leading up to the contest, to give my metabolism something to work against, so I don’t get stagnant at a certain weight. 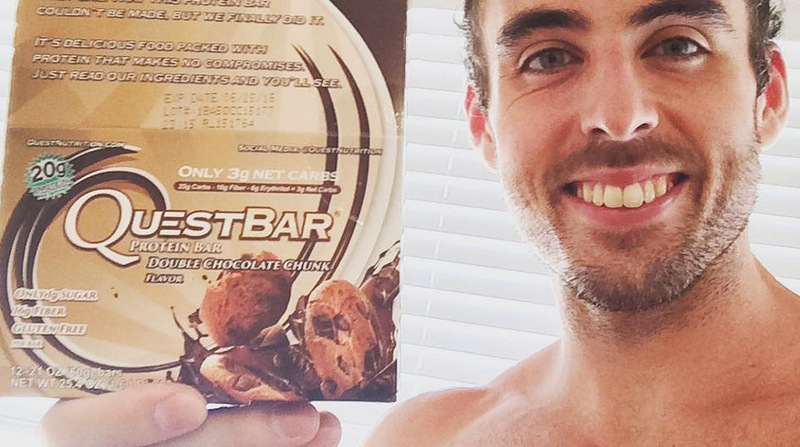 I get variety from Quest Bars. I have a couple of them throughout the day, sort of as treats. They’re great from both a gaming and a fitness perspective. I like the double chocolate chunk because… they’re pretty much just chocolate bars. But they’re high protein, moderate fat and really low net carb, which is basically what I try to eat for my competition diet. And as a gamer, they’re just really, really convenient in addition to being delicious, so when I’m grabbing for easy foods, I know they’re good for me too. I should actually probably do a video on this - if you’re sitting all day, there are some things that you should be doing just to get your body back to baseline. a. One of the big ones is stretching hamstrings and glutes. Lay on your back and lift your leg up and across your body. b. Obviously, don’t skip legs day. Your legs are resting in that chair all day. They need to do some real work. Try and get two leg workouts in a week. c. Low back extensions: These are incredibly useful when you’re sitting down all the time. If I feel like my lower back is starting to hurt, I actually do MORE lower back extensions. Strengthening those muscles is really helpful. Just remember to hinge from the waist, keep your back neutral, and squeeze your glutes at the top to get full extension. d. Core work - in general, you should do a little core work every day as part of your gym routine. And when you’re at your desk, think about sitting up and pulling your chest toward the ceiling. Actively contract those abdominal muscles so they don’t atrophy. I want to leave you with my favorite non-traditional exercise. It’s really weird. I got it from my dad. We call them runners. It’s sort of a single arm bicep curl, alternating, but exaggerated. When your arm’s in front of you, you turn the elbow up almost parallel to the floor. And then behind you, you lift the other arm way past neutral like a combination of a rear delt fly and a triceps kickback. It’s all very active, but it’s controlled. You have to be deliberate with each part of it. It’s a full body exercise. I haven’t actually done these in a while. I should probably work these back into my routine. Shout out to dad for keeping me motivated. Again.